Slack launched 5 years ago when its founder, Stewart Butterfield, made an internal tool used by his team at Tiny Speck public. "Slack" apparently stands for: Searchable Log of All Conversation and Knowledge." Slack has since grown to over eight-million daily users (according to statista.com) with approximately 3 million users paying for the service. People reportedly spend an average of 2 hours a day active on Slack while keeping the app open up to 10 hours at a time. Microsoft announced the launch of Teams in New York on March 14th, 2017. Teams was created, and is currently led, by Brian MacDonald, Corporate Vice President at Microsoft. Teams integrates with Microsoft's Office 365 as a part of the office productivity suite, but also features extensions that can integrate with non-Microsoft products. 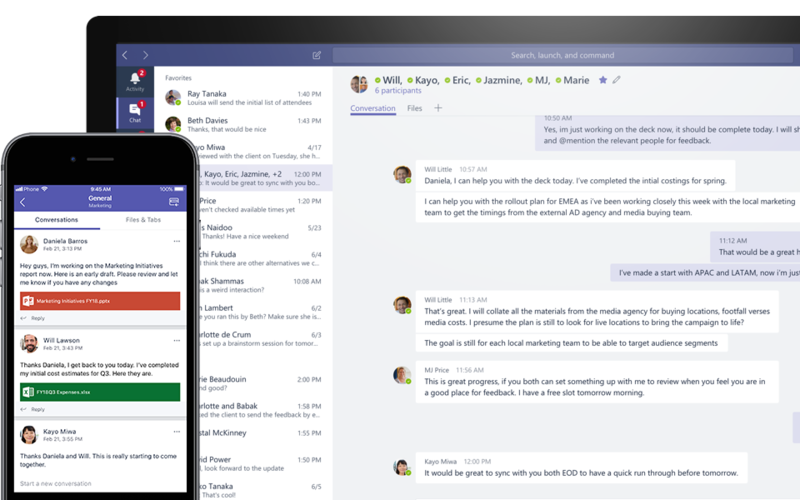 2 years after its launch, Teams is now the second-most popular collaboration and communications app (after Slack) with 329,000 organizations worldwide already using it (according to Microsoft). After that, standard plans start at $6.67 per user and adds group calling, screen sharing, and unlimited apps and guest access. The "Plus" plan promises 99% uptime, 24/7 support, and integrations with existing SSO providers or your own internal SAML solution - but this extra compliance and support will cost either $15 per user billed monthly, or 12.50 a user annually. Teams is a free part of an Office 365 subscription, but last July Microsoft released a free version of Teams for anyone to use. When used as a part of the Office 365 Business Essentials for 5 dollars per user a month, Teams gets upgraded to 1 TB/user of storage, OneDrive and Sharepoint cloud integration, meeting recording and scheduling, and enforced multi-factor authentication for all users. Pricing winner: Microsoft Teams (more value in the free version and lower cost per user for upgrading. Plus, users are actually get the full Office 365 suite of apps (including the great cloud storage solution OneDrive) PowerPoint, Excel, Word fully integrated into Teams when they have the subscription version. When it comes to features, Slack's advantage lies not in the platform itself, but in its openness - which has made it attractive to developers who have built their own integrations on top of the app. Slack also has an integration with Salesforce that Teams doesn't have. Slack also allows more third-party apps to connect to it. It is a big GIF space (which probably prompted the "Stop the GIF's" feature for people trying to get actual work done.) Slack's custom shortcuts and commands, automated reminders, and custom emoji's are other features users enjoy. Teams can't boast all of the custom integrations that Slack can, but its feature list is pretty rich - especially when you consider its integration with the full Office suite. Teams was built to eventually replace Skype for Business, so it continues to evolve into a one-stop hub for communication. In addition to chat and channels like Slack, you can create file repositories and connect other apps through tabs within a channel. While Slack packs the fun and personalization features fit for small groups, Teams was clearly designed with professionals and enterprises in mind. You can now put up to 5,000 people in one team and list import 3,500 at one time. Teams also has specific capabilities designed to aid Firstline workers like the ability to create and manage shifts. Features Winner: It depends on who is using the service and what they're using it for. Slack was hacked back in February of 2015. The result of the breach was the compromise of users data. Since then, Slack has added two-factor authentication to their service. It begs the question though? How secure is all the data being shared on slack? 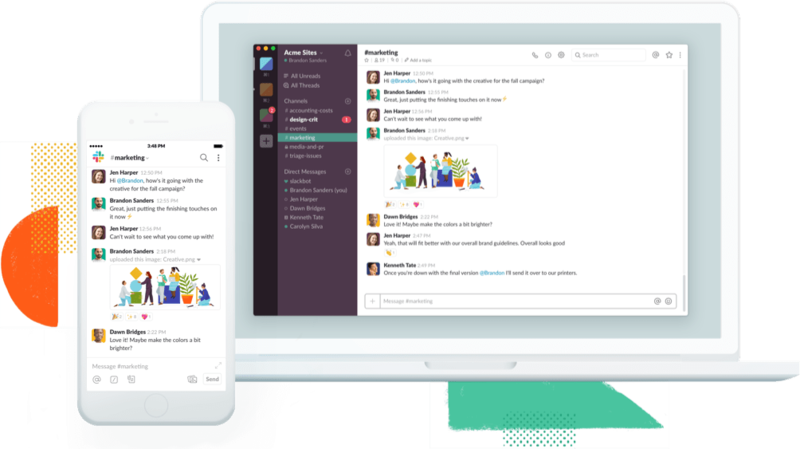 Slack has done a fairly good job of keeping its assets locked down and data encrypted at rest. However, its popularity and openness will always make it a target for cybercriminals hunting for things like passwords and sensitive user data. Slack's export features must also be paid attention to. Team owners and Admins can export all message data and files from public or private channels. Also, companies must remember to deny Slack access to employees the moment they leave the company. Teams is built on the Office 365 hyper-scale, enterprise-grade cloud. This means it must adhere to the strictest compliance standards and encrypts data both in transit and at rest. Files in Teams are stored in Sharepoint and encrypted there. Notes in Teams are stored in OneNote and share that apps encryption. Teams compliance includes HIPAA and it recently added secure messaging and care coordination features designed for the healthcare industry. Slack just announced it has also earned HIPAA compliance as of February 5th. However, it's only on the entreprise-grid scale for now. Security Winner: Teams, but credit Slack for making needed improvements in this area. Slack vs Teams - which one is "Future-proof"? Microsoft Teams is most frequently used by large and mid-sized businesses (who used to use Skype for Business), while Slack is commonly deployed by smaller organizations. Slack has a recent influx of lots of cash from investors and plans for an IPO, however Teams has Microsoft and the mass adoption of Office 365 by businesses of all sizes. A new Outlook calendar app for Slack is designed to bring all of your meetings and calendar invites into the messaging service. An updated OneDrive app wiht the ability to preview Office files directly in Slack. Outlook mail integration, with the ability to bring emails straight into Slack channels. Full previews of Office files like PowerPoint slides, Word documents, and Excel spreadsheets inside Slack without even opening them. These updates were completed via an open API - not by Microsoft. It's clear that users are benefitting from the competition between these two platforms. This move comes one month after Teams launched their free version. 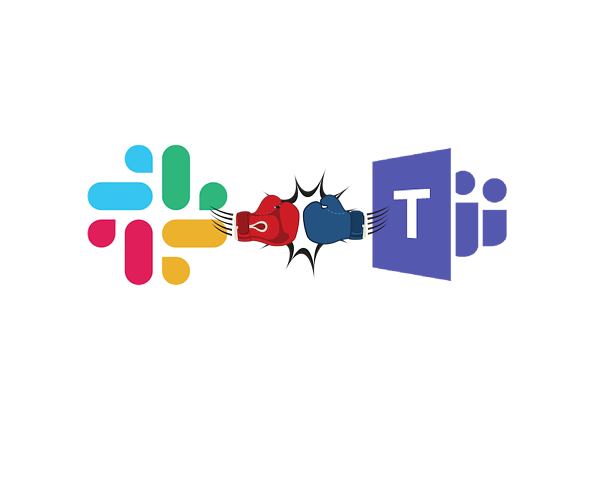 Slack's willingness to integrate more fully with Office 365 is smart and means users have real options when it comes to communication and interoffice chat. If recent statistics are any indication, while Slack was the forerunner and will be around for awhile, Teams seems to be poised to eventually pass its popular rival. According to Spiceworks, Teams is poised for the fastest growth of any business communications app over the next two years. If you want to roll out Teams to your organization and are interested in quick-start, interactive training on the app to get everyone up to speed, check out our ready, set, go Teams course today.